So you’re in Vienna for the Christmas markets and want a hotel close to enough glitz and gingerbread to delight a Disney princess? Located in a town palace built in 1882 and reopened in March 2016 after two months of alterations. My parents stayed here when they visited at Christmas a few years back and were very happy. My dad would always pop out in the early evening just to grab a quick bag of roast chestnuts from the market. Self-styled “Design Hotel” featuring a unique collection of glass art. Close to the market and the U2 subway line for getting to other destinations. Small, old-Viennese style hotel located behind the prestigious University of Vienna. It has five stars, so you don’t have to worry about whether there are fresh rolls at breakfast. It’s on Herrengasse on the other side of the Ring Boulevard, so is even closer to the Freyung and Am Hof Christmas markets. As above – the two hotels practically adjoin each other. Herrengasse also puts you close to the whole Hofburg complex, with the Spanish Riding School, plus the pedestrianised centre. This one’s a little unusual – a guesthouse that’s part of the Schottenstift (a working Benedictine Monastery dating back to 1155) and quiet: there are, for example, no TVs or radios in the rooms. Excellent value for the incredibly central location – it’s actually next to the Freyung Christmas market. 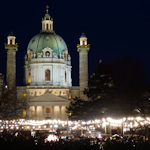 Although the Christkindlmarkt is the main market, there are several others that are smaller, but still impressive. So hotels in and around the central part of town* may well be close to a Christmas market of some description. Also, Vienna’s municipal transport system is top quality. Trams and subways are fast and frequent, so you can get to most market locations pretty easily even if you’re staying a little further away.